Short on rupees? Aren’t we all. I do wind up buying new bags of soil every year, of course, because I have a lot of containers. I also re-use soil. I typically dump my annual pots out into a big bin, as well as the pots of things that were supposed to be perennial but didn’t get that information and died anyway. I dump the pots out, break up clumps and stir in more compost. The other strategy I have been using is to fill space in the bottom of big pots with stuff other than soil. Like I said before, I have seen recommendations for using styrofoam peanuts or pop cans. The one time I tried styrofoam, it was really gross when I tried to dump it and reuse the soil- muddy foam chunks. It was such a mess, I never want to try it again. Last year, I read on the interwebs) about a development group in urban Mexico which was helping people grow their own food in 5 gallon buckets. They got free buckets from stores, but their soil was in short supply, and they were low on rupees (er, I mean pesos) too. They did have access to weeds, sticks and branches. 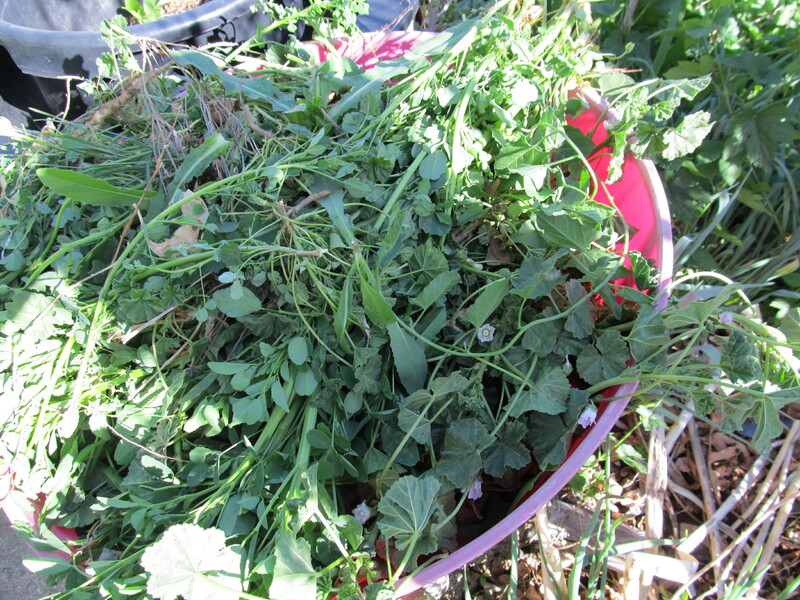 They experimented with chopping up twigs and weeds and filling the buckets most of the way, then filling to the top with good soil. Then they would plant tomatoes and other plants. By the end of the growing season, the sticks and leaves would have decomposed, and they would have rich new soil for the next time. So, I read this last year, thought about my shortage of pesos, rupees, er, dollars… and thought to myself, I have weeds, sticks and branches… I tried it with two pots, I used twigs no bigger than a pencil to fill most of the pot, then a big wad of dandelions. Since I knew it would break down, I filled it to within a couple of inches of the top, then put in the decent soil and plants. One pot held an artichoke, and it didn’t do well at all. I suspect it was because when we left town it got too dry. I was counting on all the organic matter in the bottom to be a reservoir for moisture, but the roots just hadn’t gotten that far down yet when we went on vacation. The other pot had a pomegranate tree, and it is doing fine a year later. I brought it inside last fall, it went dormant for a couple of months, then woke up again and started putting out leaves with the sun that came through the basement window. The soil level did sink down- it started an inch below the rim, now it is probably 4 inches below the rim. I had planned on re-potting the pomegranate anyway, the sinking soil just accelerated the process. In the future, I don’t think I’ll use this method for perennials, it is kind of a pain to re-pot anyway, so doing it twice as often doesn’t seem to be worth it. I have done it again this year, with a pot of lilies mixed with sugar snap peas- I want the peas on the patio for snacking on, and the lilies are for color. I could say I want the lilies to act as living trellises for the peas, but that would imply I had planned ahead. I have a couple other big pots that need filling, for geraniums and stuff, and we certainly have enough weeds and sticks.